1. The heat coming off of the massive, buttery yellow oven at Innocenti Biscottificio Artigiano. It diligently turns out countless biscotti each morning including my favorite, the brutti ma buoni. Stefania was nice enough to let me shoot there one afternoon. She told me it was her mother who was queen of the biscotti, and that she took over the shop after her death. Via della Luce, 21, Trastevere. 2. The Pantheon at dawn, piazza empty. 3. Every public clock set to different times - most are wrong. 5. A gang of five ten-year-old girls adeptly pick-pocketing strangers at the Trevi Fountain. 8. A school bus on foot or scuola bus a pied! Eight tiny kids following their "driver" in tight formation as they walked on to the next stop. 12. Mind-rattling church bells at 7 a.m.
14. Potato rosemary flatbread drizzled with olive oil. 15. Mosquito bites upon mosquito bites on my feet, bottoms of feet, wrists, and ankles. 16. Open wi-fi networks in piazzas and sitting on church steps throughout Trastevere. 17. Five hundred water bottles and cheap plastic soccer balls churning in the shallow waterfall beneath Ponte Garibaldi. 18. Pavarotti posters large in music store windows. 19. An accordion, bass, piano, and violin providing music two tango dancers at the foot of the Pantheon one evening. Their shadows were cast large on the facade and columns while hundreds of onlookers watched. 20. The hypnotizing swarms of swallows starlings who decided to see us off on our last night in Rome. Their seemingly effortless arobatics at sunset in the skies over the Tiber was one of the things I'll remember best about the trip. Have a look at Richard Barnes's beautiful starling photographs to get a sense of what I'm talking about. Fred Plotkin's Gourmet Guide to Italy: Fred Plotkin's book has been a been in my travel bag every single time I've visited Italy. He meticulously outlines restaurant suggestions, markets, gelaterias, and local specialties worth pursuing - organized by city/town. Its great. I've purchased four copies because I keep giving it away to friends. It's a weighty volume, so I (sorry!) cut the book into sections depending on which part of the country I'm traveling to - north, south, central, etc. There is a brand new, updated edition out so keep your eyes peeled for it. City Secrets Rome - edited by architect Robert Kahn. This is a fantastic gem of a guide book, a mix of art, restaurant, and cultural recommendations. What makes it unique is the contributers - fellows, residents, and friends of the American Academy in Rome share their favorite discoveries and places to visit. 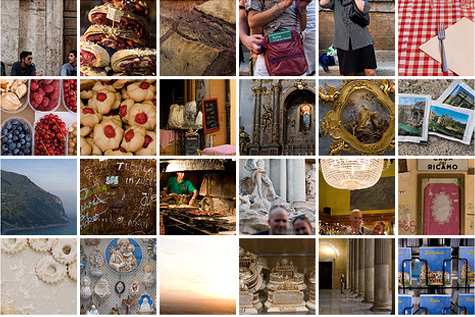 - David Lebovitz on Rome here and here. - Shauna in Umbria on her recent honeymoon. - Photos from my trip to Puglia last year. Update: Wayne was nice enough to plot many of the points (and a few extra for good measure) to a Google Map. Portland is a great city, I'd like to try to get there more often - it's just a short flight from San Francisco. Here are an updated list of a few of the places I always try to get to when I visit. A whirlwind trip to Chile and Argentina with my friends Gwen and Mai. From Santiago to Buenos Aires - and dozens of wineries and restaurants in between, I returned with a notebook full of notes, stories, and recipe ideas.